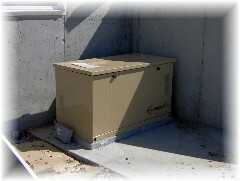 Considering Lacombe, LA Home Generators? In many coastal areas, a power outage can happen any time during lightning storms or hurricane season. Being stuck in a dark house while food spoils in the refrigerator, lights go out, no cooking appliances work, and the heat or cold creeps in can mean the difference between surviving well or not. Unfortunately, there’s never a way to know how long the power will be out. So being prepared for any situation is vital. Home generators can give you that edge. 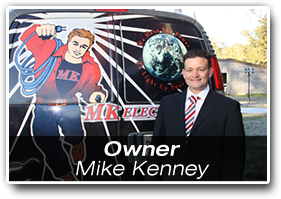 If you have been thinking about a Lacombe home generator for backup power during blackouts, the experts at MK Electric Man have some great advice for you. Whether it’s a Lacombe hurricane or lightning storm that takes out your power, blackouts can be dangerous for homeowners. Unfortunately when a blackout occurs, there is little to no warning. That means those who are prepared in advance have the best chance to stay safe. A Lacombe home backup generator can be installed by an experienced electrician so you have the power needed to run any security alarm or security lighting systems. This helps you and the family stay more secure in the home. There are many home generator sizes to power what you need during a blackout. From your entire home to just a few lights and devices, you have options. Ask your MK Electric Man Lacombe Electrician for more information. What Size Lacombe Home Generator Is Best For Emergencies? That depends on how many electrical devices you want to run during a power outage, and how long you want to run your home generator for. For instance, with a 3500 to 6000 watt generator (mid-sized unit), you can power a typical house with limiting what you are running. If you need to run the electric furnace or water heater, you may need a larger one. 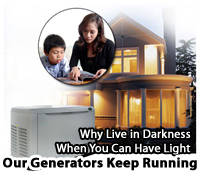 There are larger home generators that turn on and shut off automatically to give you seamless whole house power. These systems use advanced technologies to ensure you have all the power you need in your home during blackouts. With these larger whole-home systems, the generator will need to be maintained so you can run them indefinitely as needed. For more information about Lacombe Home Generators, please call our professional electricians at 985-882-4001 or complete our online request form.